Let it not be said that President Obama does not keep his promises. As he prepared to accept his nomination for re-election last week, the president made good on a promise he made at the beginning of his term: No CIA officers will be prosecuted for torture. Attorney General Eric Holder quietly announced before the convention that the last two torture investigations would close (like all the prior investigations) without any charge. As a virtual afterthought, the Justice Department added that it would not address the “propriety of the examined conduct.” The “impropriety” involved two suspects who died under torture by CIA officials. For those still infatuated with Obama, the announcement was the final triumph of “hope” over experience. Since Obama ran on a civil liberties platform, many expected an independent torture investigation as soon as he took office. After all, waterboarding is one of the oldest forms of torture, pre-dating the Spanish Inquisition (when it was called tortura del agua). It has long been defined as torture by both U.S. and international law, and by Obama himself. Torture, in turn, has long been defined as a war crime, and the United States is under treaty obligation to investigate and prosecute such crimes. However, such a principle did not make for good politics. Accordingly, as soon as he was elected, Obama set out to dampen talk of prosecution. Various intelligence officials and politicians went public with accounts of the Obama administration making promises to protect Bush officials and CIA employees from prosecution. Though the White House denied the stories, Obama later gave his controversial speech at the CIA headquarters and did precisely that. In the speech, he effectively embraced the defense of befehl ist befehl (“an order is an order”) and, in so doing, eviscerated one of the most important of the Nuremburg principles. Obama assured the CIA that employees would not be prosecuted for carrying out orders by superiors. This was later affirmed by Holder’s Justice Department, which decided that employees carrying out torture were protected because they followed orders. The administration then decided that those who gave the orders were protected because they secured facially flawed legal opinions from the Justice Department. Finally, the Justice Department decided not to charge its own lawyers who gave those opinions because they were their . . . well . . . opinions. This, of course, still left two inconvenient corpses in Iraq and Afghanistan. In 2002, Gul Rahman was grabbed in Pakistan while seeing a doctor who is the son-in-law of an Afghanistan warlord. He was taken by the CIA to the infamous Salt Pit, a former brick factory north of Kabul. He was beaten by guards, stripped and shackled to a cement wall in near freezing temperatures. He froze to death overnight. The CIA officer in charge of the prison who ordered the lethal abuse has been promoted, according to the Associated Press and The Washington Post. 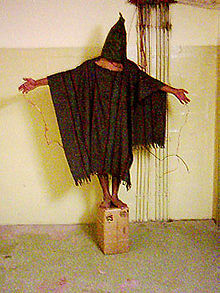 The second torture case was that of Manadel al-Jamadi, who died in 2003 in Iraq’s infamous Abu Ghraib prison. Al-Jamadi’s face was featured in pictures with smiling U.S. troops posed with his dead body — giving the thumbs up sign. A CIA official had interrogated al-Jamadi by suspending him from a barred window by his wrists, which were bound behind his back. The CIA interrogator, Mark Swanner, continued to demand answers even when al-Jamadi stopped responding. Swanner accused him of “playing possum” and ordered him to be repositioned for more interrogation, according to a New Yorker account. The guards finally convinced Swanner that the man was deceased. Al-Jamadi’s death was officially ruled a homicide. Not only have people like the commandant at the Salt Pit been promoted, but various CIA officials associated with the abuse of detainees have also been promoted under President Obama. Likewise, the lawyers responsible for those now rejected legal opinions have been promoted. One of the most notorious, Jay Bybee, was even given a lifetime appointment as a federal judge in California. We have gone from prosecuting torture as a war crime after World War II to treating allegations of torture as a “question of propriety” under Obama. Hundreds of officials, including President Bush, were involved. People died in interrogation. High-ranking CIA officials admitted that they destroyed evidence of torture to keep it from being used in any later prosecutions. Yet, after a years-long investigation, not a single CIA official will be charged with a single crime connected to the program. Not even a misdemeanor or a single bar referral for an attorney. Well, no one except former CIA official John Kiriakou, who is awaiting trial on criminal charges for disclosing information on the torture. After World War II, political philosopher Hannah Arendt coined the phrase “the banality of evil” to describe those who committed war crimes. The Obama administration now can add the “impropriety of torture” to our lexicon. The image of a man beaten, stripped and frozen to death in a CIA prison is not nearly as unnerving as a nation that stood by and did nothing about it. We have become a nation of dull-eyed pedestrians watching as our leaders strip away the very things that distinguish us from our enemies. With our principles gone, we are left with only politics and, of course, our sense of propriety. The billionaires lost the election. Thank whatever God you pray to.